There is a famous remake, now welcome to the original! Plein Soleil, otherwise called Purple Noon, is simply flawless … from the performances, to the direction, editing and cinematography. The screenplay was adapted from a brilliant suspense novel by Patricia Highsmith and directed by one of France’s leading directors at the time, René Clément. Clément directed such films as The Battle of the Rails, Forbidden Games, The Day and the Hour and the epic Is Paris Burning. 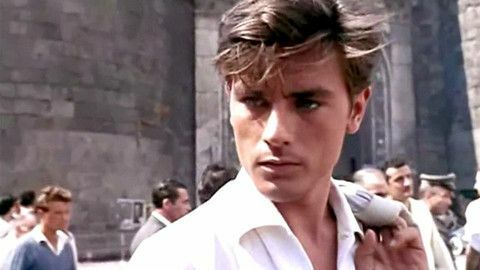 Actor Alain Delon was then considered a light romantic lead with his chiselled good looks and smouldering gaze. This role came along and out came this whole new sinister persona. This was an amazing turn for Delon who made an excellent Tom Ripley. Delon co-stars with the wonderfully gifted actor Maurice Ronet and beautiful and talented actress and singer Marie Laforêt. Look for Austrian-born actress Romy Schneider who appears at the beginning of the film briefly as one of the companions of Philippe, played by Maurice Ronet. Ms. Schneider was Delon’s fiancée at the time. I first saw Plein Soleil when I was barely in my teens and taking French classes in school, I was hooked! My mother first introduced me to these films via the late night reruns on tv. Needless to say, I bought Paris Match from then on just to get a glimpse of gorgeous Alain. By this time he had grown a little older and ever more handsome. I’d still love to meet him someday, just to let him know how much we’ve enjoyed his films.